In the sky there is peace. Weird and wonderful street life. Right: Every day of the year a few hundred bodies are burnt here. Spinning, dipping, swirling, the evasive kites glide high. 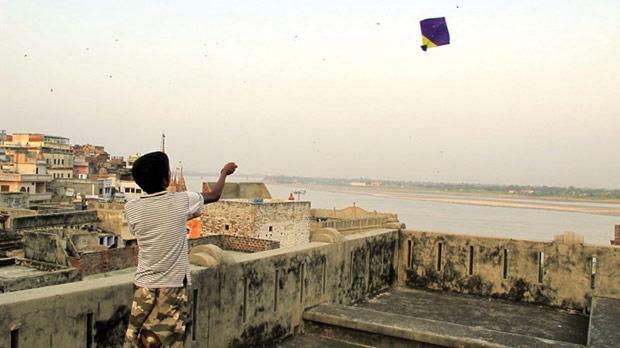 Over the great river Ganga they sore, freedom from the urban jungle, from the enigmatic city they fly above. Every afternoon I would come up to the flat rooftop of the homestay and watch the kite flyers. Because sometimes India’s holiest city was far too much to handle. Gangs of wild monkeys patrolled their patches; men carried dead bodies through the streets on green bamboo stretchers; scam artists lurked on every corner; a deformed beggar was often in my periphery; the smoke of burning bodies was never far away and there were people everywhere, always; a never-ending stream of people weaving their way through the Varanasi labyrinth. The interaction of life was inescapable. And I was a part of it. The buildings in Varanasi’s old town were so close to each other that a single prostrate cow could block the entire street. People had tried to get as close as they could to the sacred entrances of the Ganga, each person erecting their narrow house deliberately wonky to maximise the meagre space. Walls leant outwards so the gaps between rooftops were ideal for a novice roof jumper. On the ground there was hardly space for a bicycle; motorised vehicles couldn’t get in. The shape of these buildings precluded sunlight, and meant the city was in a permanent shadow. But it wasn’t gloomy. Like sunglasses on a dazzlingly bright day, the shadows made everything manageable. Without the shade you would have to walk head down, shielding your eyes from the intensity because no building was only a house; every ground floor room was open and housed shops, mini-factories, guesthouses, or a little store to pick up a cup of masala chai, the quintessential Indian tea drink. These narrow streets were always flooded with people. Some just hanging out and catching up on gossip, others playing speed chess, people following a body towards a funeral, and those like me, just wandering. On these streets it was impossible for me to go more than a few seconds without someone engaging me in conversation, asking if I wanted to buy something, enquiring about my home country, saying hello and “welcome to my India” (India always belonged to them, nobody ever said “welcome to India”). The beggars didn’t really stand a chance. Their pleas for help always disappeared in the audio competition. Elsewhere in India the relentless drone of motorbike horns and rickshaw exhausts dominated the soundtrack, and drowned out any delightful audio nuances. 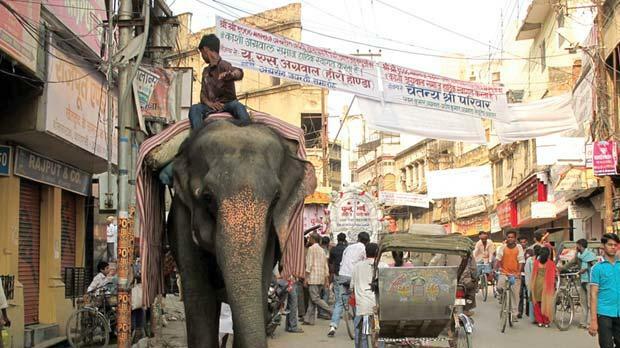 In Varanasi I could open my ears. Ritual bell ringing came from a hidden temple, hawkers called up to the rooftops with metronomic consistency, animals bellowed freely, speakers crackled as they emitted spiritual music, and, of course, I could always hear the natter of people. No one sound was overpowering. The “chai chai chai” shout of a café owner fades as I turn a corner. The choked intonation of a funeral chant dominates only briefly, as six men charge past, and I follow intrigued, trying to keep pace with the body wrapped tightly in orange on the stretcher. As we approach the Burning Ghat a man stops me. He looks the part – orange robes and a straggly beard – and claims to be a volunteer from a hospice that helps poor people without families to have a dignified death. He leads me to an eerie abandoned building with a second floor balcony overlooking a number of burning piles of wood. I can feel the heat and see the smoke of seven large piles of timber which burn beneath bodies in different degrees of recognition. A solitary detached leg burns in one fire, a face has shrunk in another, the flesh burnt away to leave a frail harrowing skull. Other fires had just began to smoke and the skin of the dead above them was still pale. 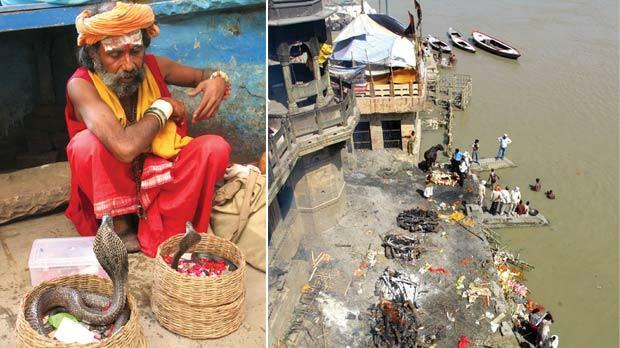 Baba G tells me that being cremated ceremonially like this, at the entrance to the Ganga, releases the soul, and many people save for their own send-off, knowing that salvation comes with this final of rituals. Maybe, I thought, it is one of the reasons why India is one of the very few countries in the world where the poor people are enviably happy. In full view of the burning bodies four locals bathe, washing themselves with soap and jumping in the ashen water to clean. Cows plod around in the shallow water, munching away at the discarded flowers which once decorated a body. Hoping to find a golden tooth, two boys sift the riverbed. Stray dogs are also here, scouring around for the remains of people who couldn’t afford the 200kg of wood required to turn a body completely into ash. Every day and night of the year a few hundred bodies are burnt here. All that usually remains is part of a hip bone or a breastbone. These are taken and ceremonially dumped into the Ganga. Why could I not stop staring at the scene? Perhaps it was because in a place that should have been so depressing I saw only beauty. The scene was captivating, the death was enchanting. And there is no mourning. Grieving in this place is believed to prevent the soul from being released from the body. A random assortment of homeless people on the verge of death loiter near me, hidden in the shadows. Shaking her arms at me, a frail decomposing woman emerges, the whites of her eyes shining in the shadows. Baba G explains that I must contribute to a universal wood fund for poor people in return for being allowed to witness the spectacle. Was it a scam? Whatever I try and offer they want more and more, until I can’t take it any longer and throw a few notes towards them and head off. The same streets have now become overpowering. I’m going too fast, head down, getting lost in the labyrinth; people trying to sell me something, cows getting in the way, all the sounds and the people too much, and my head experiencing a delayed reaction to watching so many funerals. Eventually I find the homestay and I go straight to the roof. Ravi is there, flying his kite in a gaudy striped shirt. His friends and younger brothers watch on, learning and admiring as Ravi sails his piece of material across the sky to take on an opponent. And I watch enthralled, away from the urban jungle, sitting and listening to my thoughts. In the sky there is peace.